EFCC in a joint operation with INTERPOL have nabbed a notorious Nigeria Internet fraud popularly known as "Yahoo yahoo" kingpin in Port Harcourt,Nigeria.In a statement released by the commission on Monday, the 40-year-old Nigerian kingpin, known as Mike, is believed to be behind scams totalling more than $60m involving hundreds of victims worldwide. email accounts of small to medium businesses around the world, including in Australia, Canada, India, Malaysia, Romania, South Africa, Thailand and the US, with the financial victims mainly other companies dealing with these compromised accounts. "Heading a network of at least 40 individuals across Nigeria, Malaysia and South Africa, which both provided malware and carried out the frauds, the alleged mastermind also had money laundering contacts in China, Europe and the US who provided bank account details for the illicit cash flow. 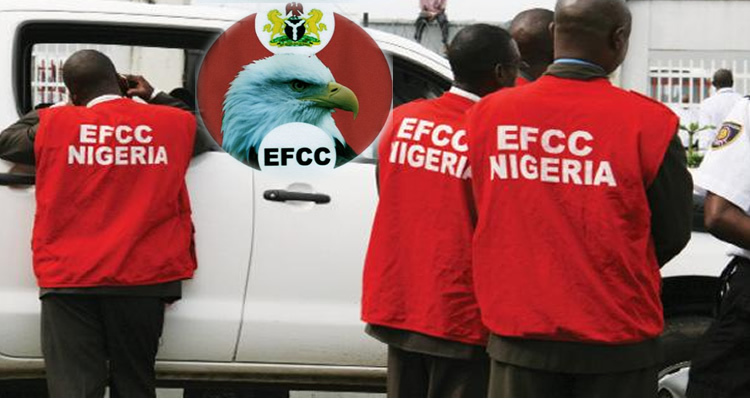 "Following his arrest in Port Harcourt in southern Nigeria, a forensic examination of devices seized by the EFCC showed he had been involved in a range of criminal activities including business e-mail compromise (BEC) and romance scams. "The main two types of scam run by the 40-year-old targeted businesses were payment diversion fraud – where a supplier's email would be compromised and fake messages would then be sent to the buyer with instructions for payment to a bank account under the criminal's control – and 'CEO fraud'. "In CEO fraud, the email account of a high-level executive is compromised and a request for a wire transfer is sent to another employee who has been identified as responsible for handling these requests. The money is then paid into a designated bank account held by the criminal. "Mike first came onto the law enforcement radar through a report provided to INTERPOL by Trend Micro, one of its strategic partners at the INTERPOL Global Complex for Innovation (IGCI) in Singapore. This, combined with actionable analysis and intelligence from Fortinet Fortiguard Labs in 2015, enabled specialists at the INTERPOL Digital Crime Centre, including experts from Cyber Defense Institute based at the IGCI, and the EFCC to locate the suspect in Nigeria, resulting in his arrest in June." Abdul Chukkol, head of the EFCC cyber crime section, said that the transnational nature of business e-mail compromise makes it complex to crack, but the arrest sent a clear signal that Nigeria could not be considered a safe haven for criminals. "For a long time we have said in order to be effective, the fight against cybercrime must rely on public-private partnerships and international cooperation," Chukkol said. "The success of this operation is the result of close cooperation between INTERPOL and the EFCC, whose understanding of the Nigerian environment made it possible to disrupt the criminal organization's network traversing many countries, targeting individuals and companies." Noboru Nakatani, executive director of the IGCI, warned that BEC poses a significant and growing threat, with tens of thousands of companies victimised in recent years. "The public, and especially businesses, need to be alert to this type of cyber-enabled fraud. Basic security protocols such as two-factor authentication and verification by other means before making a money transfer are essential to reduce the risk of falling victim to these scams. It is exactly through this type of public and private sector cooperation that INTERPOL will continue to help member countries in bringing cyber criminals to justice no matter where they are." A 38-year-old hacker was also arrested alongside the suspect,and both would face charges including hacking, conspiracy and obtaining money under false pretences. They have both been released on administrative bail as the investigation continues.